I think I mentioned I got 3 whole organic chickens at Wholefoods a few weeks ago and I took one out of the freezer because we were getting ready for yet another snow storm filled weekend. We’ve had close to 100” on snow this year and we were all praying for a winter like last year. Well those of us who don’t ski that is. This recipe was adapted from Diabetes and Heart Healthy Cookbook published by American Heart Association. I adapted it for chicken they did a 5 lbs. turkey breast. 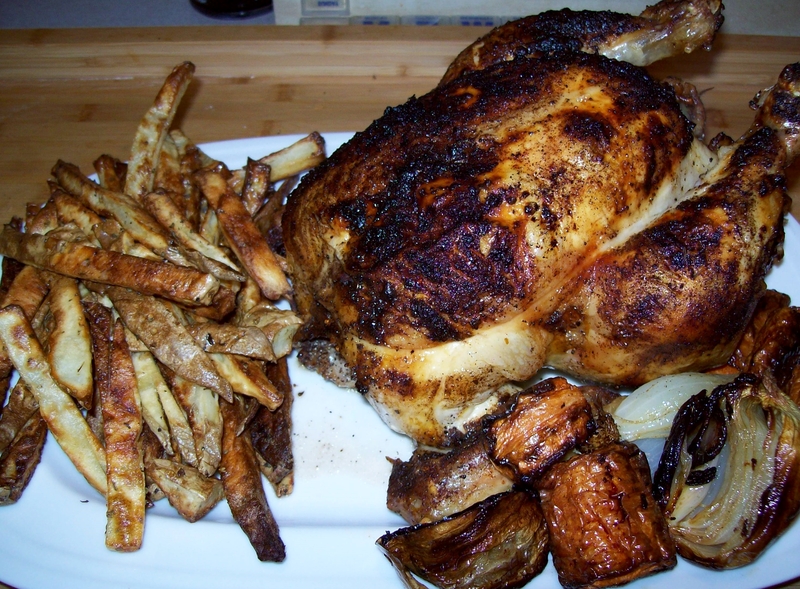 The smell of this spice rubbed chicken, was driving us crazy while it cooked. Yes it was one of Lyn free meals this week. 1- 2 teaspoons of soften unsalted butter. Spray a roasting pan and baking rack with nonstick cooking spray and set aside. 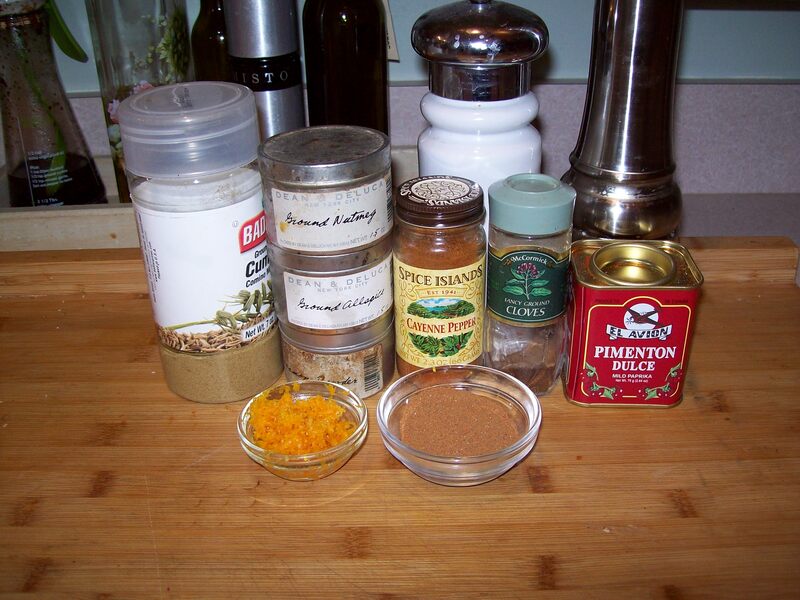 In a small bowl, stir together the spices. Rub small amount of rub inside the cavity of chicken. Stuff orange in cavity, you can add some onion if you want. 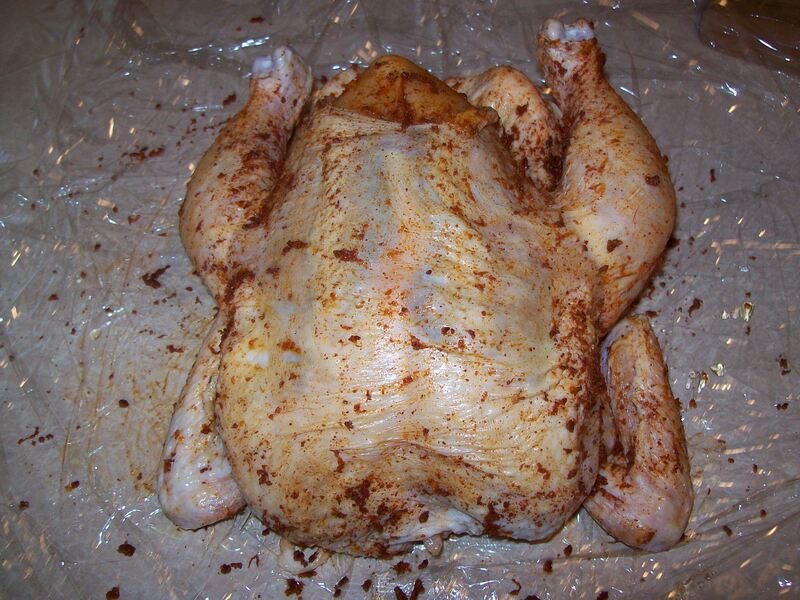 Rub spice mixture evenly under and over the skin. Place the chicken on the rack in the roasting pan, and insert a meat thermometer in the thickest part of the thigh making sure it doesn’t touch the bone. Roast, uncovered, for meat thermometer 170 degrees (if skin becomes to brown you can loosely tent with tin foil. Let the chicken stand for 15 minutes. Carve the chicken and enjoy. We all sighed with relief when the ground hog did not see his shadow and it was declared an early spring it would be! He just neglected to tell us that it would be a stormy snowy wait starting with a 28” blizzard. Then at the beginning of last week it was another 10-14” by midweek 6-8” by the end of the week we were in the 4-6” and by the time Lyn and I pulled into the garage on Sunday afternoon they were saying not even an inch. You just have to laugh. We actually ended up with about 2” after it was all said and done and it did snow pretty much half of Saturday and all day and night Sunday just did not amount to much. Wait more snow on this Wednesday. 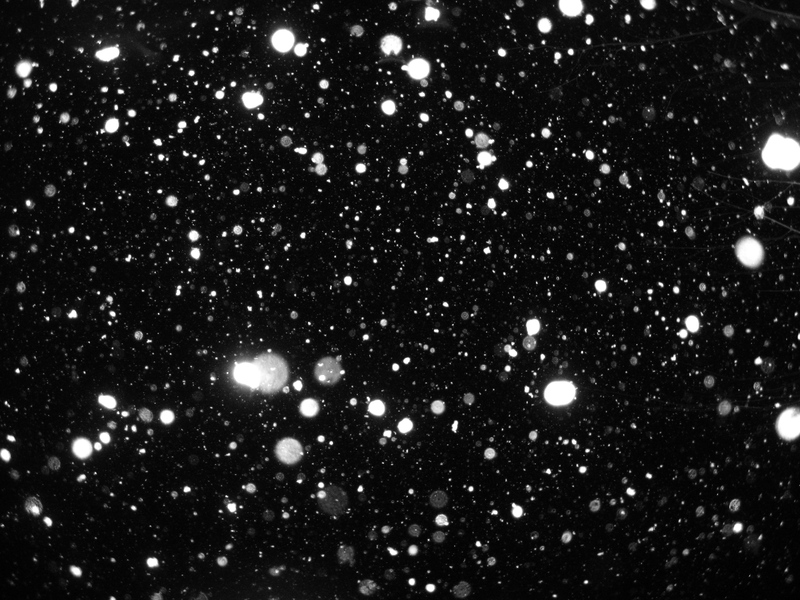 I love the snow fall that has huge flakes drifting slowly to the ground it can be memorizing if not hypnotic as you stare out into the bliss lost in memories of running around catching flakes with your tongue as a child. So what does one do on a snowy Sunday afternoon I decided roasting one of the organic Chickens I got from Whole Foods on sale last week, it was one of those lunch time shopping expeditions were you are armed with a list and you race around beating the clock, my list chickens, strawberries and lunch. Returning to work Nicole directed, very nicely, the placing of all our bags in the lunch room frig. I got the fun job of throwing out someone’s long deserted and now disgusting lunch from who knows when. I am sure you all have an office frig that collects things. Anyway I babble…. 450 degree oven cook for 40-60 minutes until thickest part of thigh is around 165 degree. Basting optional, I did at halfway point since the pan I used was to long. 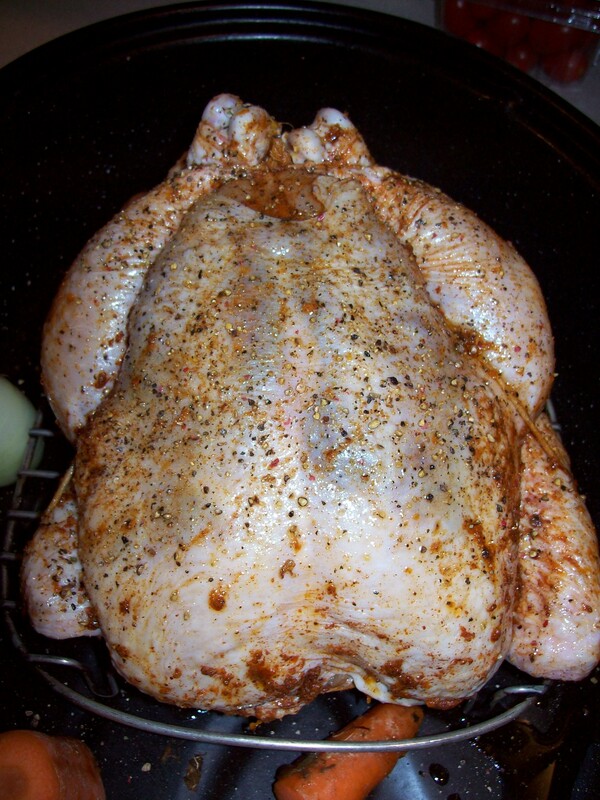 Depending on the depth of the oven if you can have legs facing the back if not rotate pan ½ through. If you feel the skin is getting to dark then tent with aluminum foil. You can make pan gravy if you want deglazing with some white wine, I opted out since I was making some Russet oven bake fries. There are hundreds of ways and every one is correct I just use this methods cause I find it easy. Start at the back of the chicken, tuck the wings under and tuck the neck cavity flap under. Taking some twine run it across the neck cavity along the groove where the thigh and body meet bringing it under the end of the drum stick crossing left to right bringing it to the top pulling the legs together and tying a knot. The uniform shape insures more even cooking. Thanksgiving Turkey with Maple Syrup and Crispy Bacon Glaze. 1 large sweet onion quartered. Wash and pat dry the turkey. Place the turkey, breast side up, in an oven-roasting bag. Add the hot sauce, 1 tsp. salt and 1 tsp. pepper to the buttermilk container; shake to combine. Pour the buttermilk mixture over the turkey trying not to get in cavity. Seal the bag, transfer to the refrigerator and let marinate, overnight turning the turkey over once at least 5 hours. I also turned on side for 1 hour each side. Remove the turkey and pat dry inside and out. Rub the skin with 1 tbsp. oil; season with salt and pepper. Let rest at room temperature. 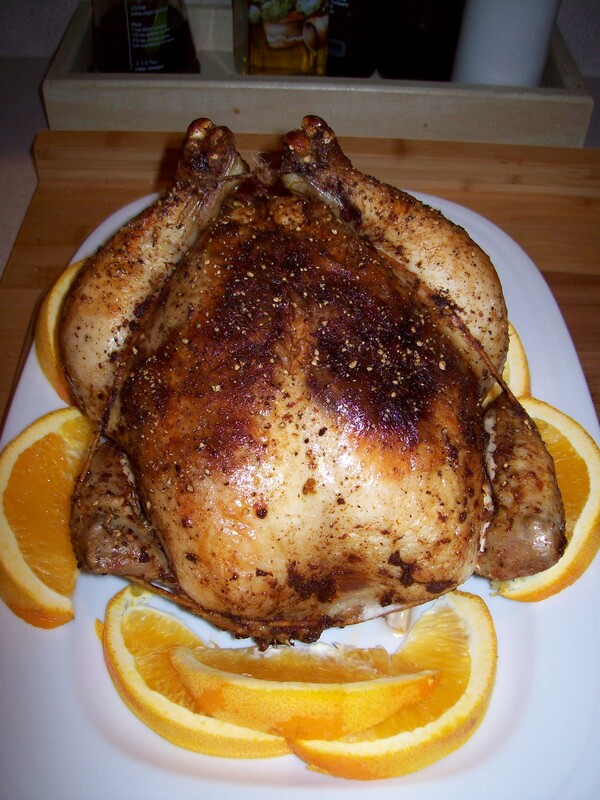 Stuff turkey with oranges and onion in body and neck cavities. 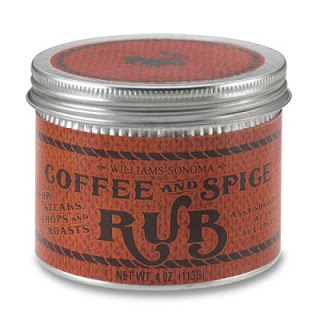 This is great with chicken also, really adds moisture in my opinion. Preheat the oven to 400 degrees . Tuck the wings behind the back of the turkey. 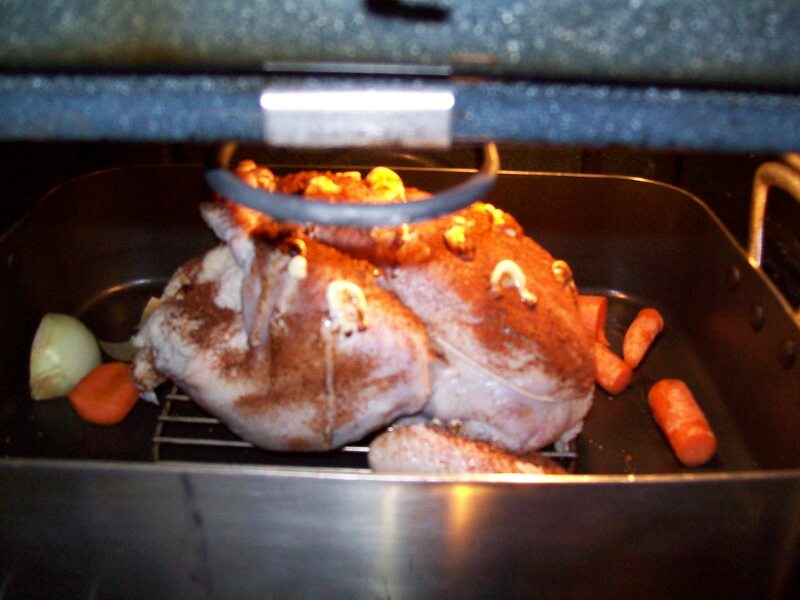 Place the turkey, breast side up, on a rack set in a large roasting pan. Roast, basting once with the pan juices, for 1 hour. Lower the heat to 350 degrees and roast, basting every half hour, until an instant-read thermometer registers 155 degrees when inserted into the thigh, 1 to 1 1/2 hours more. If the turkey is over browning, tent with foil. Remove from the oven, tent and let rest for 30 minutes. We also basted with some maple syrup mixture at the end and allowed to crisp up. Save 1-3 tbsp of drippings for the Make Ahead Gravy. 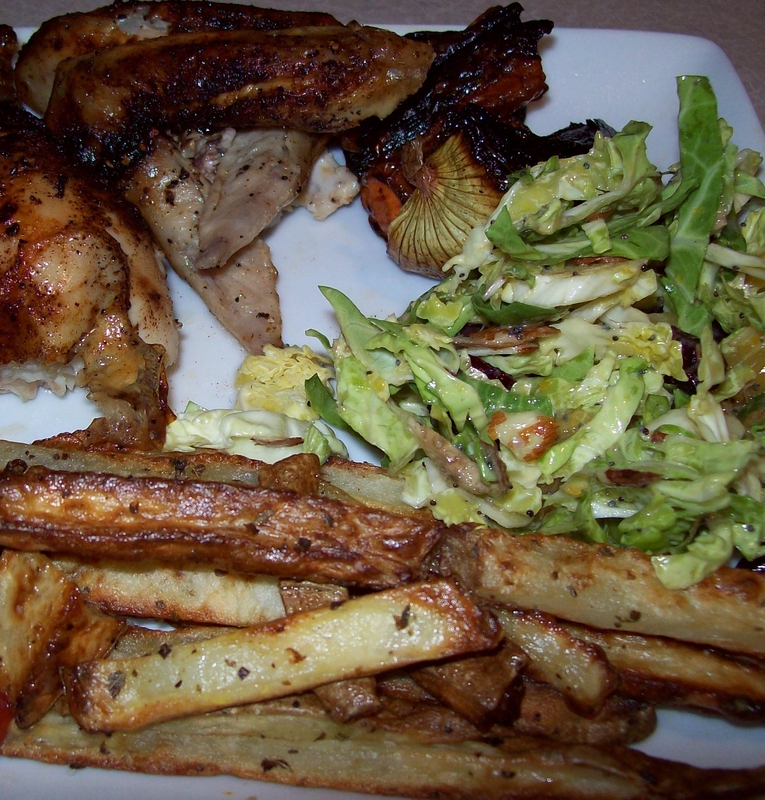 Note: The skin was nicely colored, crisp and tasty the meat was really juicy and tender even the breast. This is from an old post I put on facebook. I just love the taste of slow roasted pork or even a sirloin beef roast. I have never been able to make a pork roast like my mother in-law Rose did, it just melted in the mouth. She turned me on to the fact that pork had a lot more going for it then just bacon. Kosher bacon of course. 1 tablespoon plus 2 teaspoons agave nectar – eyeball it or here is a hint if you are using measuring devices for honey or the likes. Spray them lightly with oil and they will slide right out of the spoon or cup. After you have browned the pork on all sides and removed from pan add the apple sauce and use to deglaze scrapping up the brown bits with a wooden spoon over medium low heat, add the rest of the ingredients and stir constantly until it thickens up season with salt and pepper to taste. Salted with about 2 teaspoons of salt, wrapped in plastic wrap and refrigerated for half the day but it should work if done for at least an hour. Preheat oven to 250 you know your oven. Optional preheat the oven to 400-450 and turned down to 300-325. I usually do this with meat but where I browned the meat first I did not think it is necessary. I was right. Maybe use if you do not like to brown or making gravy. Ok here’s the thing I got to talking with Lyn and did not notice how long it took to cook. Estimate about 15-20 minutes per pound but then you know your stove. 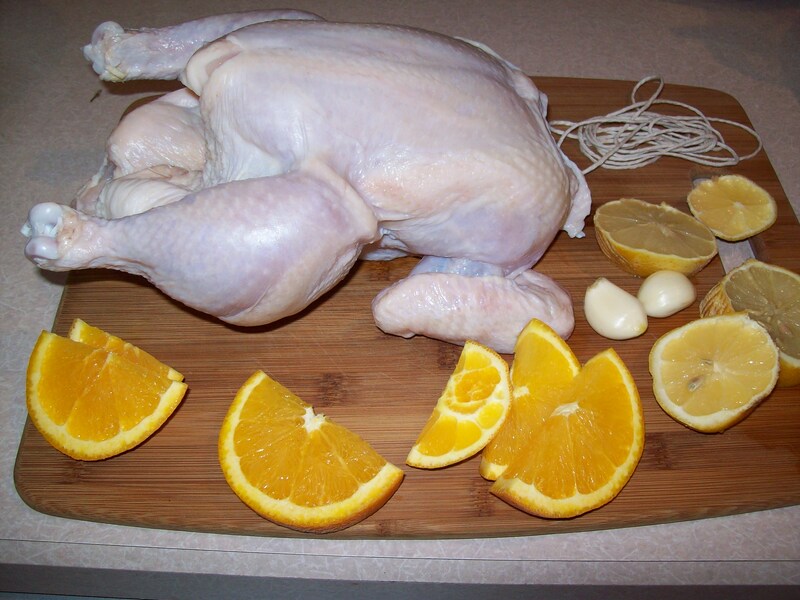 Let it sit on counter loosely covered for at least 15 minutes, slice and season to taste. My wife’s a pepper head. You can do the same for sirloin beef roast just use liberal salt and pepper, different gravy though, I don’t do gravy for the beef. 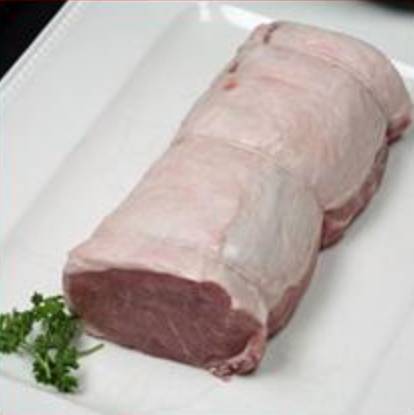 Slow and low cooking makes a tender flavorful roast with these cuts. Season to taste after slicing.